Honda civic is the famous model among honda brand. Civic models popular with type R version, the front wheal sport car. Today in 2011, civic generation have new model. Its a hybrid version, civic hybrid 2011. This civic hybrid 2011 looks alike civic fd model. The 2011 civic hybrid comes with 4 doors, and 5 passenger family sedan. It is available in four trims. 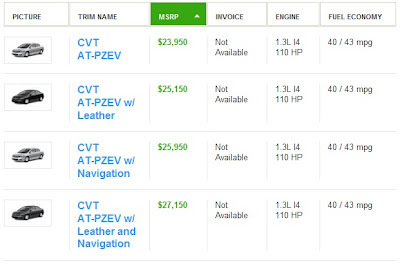 Civic hybrid 2011 raging from the CVT AT-PZEV to the CVT AT-PZEV w/ leather and navigation system. Civic hybrid 2011 comes with 1.3 liter, l4 engine.This hybrid engine produce 110 horsepower. This engine can achives 40mpg (mile per gallon) for city usage and 43mpg on the highway. This civic hybrid 2011 comes with automatic transmission.